Having received training from an enigmatic organization known as the Keepers, Garrett leaves the order and goes back to the life of a thief on the streets of the City. Once you enter the underworld you have to deal with all the consequences – you are not the only one out there looking for decent loot. Hide in the shadows of the dark, savage city. Sneak into old ruins, haunted cathedrals and mansions of the rich. Incapacitate your enemies quietly or in an open fight. This unique sneak-em-up game provides you with a range of means to achieve your goal. Remember though – secrecy is your best friend. THIEF GOLD is a first-person perspective stealth game. It was the first game to use light and sound gameplay mechanics – different surfaces cause varying noise (for example carpets are quiet and ceramic tiles are very loud). You can use sound to your advantage – it’s not only your main source of information on how close your enemies are but you can use it to distract them, for example by throwing objects. With unscripted levels, and objectives and paths altered based on difficulty settings, THIEF™ GOLD can give you hours of non-repetitive gameplay. 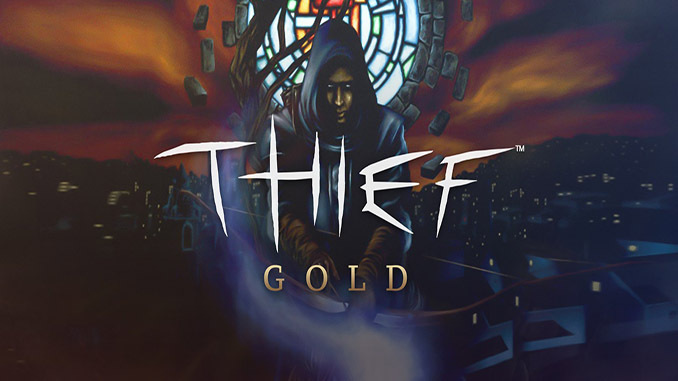 – THIEF GOLD includes THIEF™ THE DARK PROJECT and the GOLD update (three new campaign missions which deepen the plot and five new types of enemies). – An immersive stealth experience from a first person perspective, allowing direct confrontation if desired. – Pioneer of the stealth game genre for the PC and the first game to use light and sound gameplay mechanics. – Unique atmosphere of tension powered by ubiquitous darkness and suspense. Having received training from an enigmatic organization known as the Keepers, Garrett leaves the order and goes back to the life of a thief on the streets of the City. Once you enter the underworld you have to deal with all the consequences – you are not the only one out there looking for decent loot.